I am finally doing it. 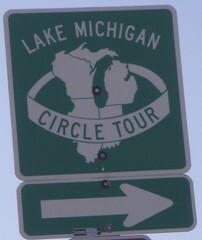 I have wanted to do the lake Michigan circle tour since the day I got my license at 16 and come the end of July '08 its going to happen. Im posting the topic early because the more information I can gather, the better. Anyone here ever taken the trip? 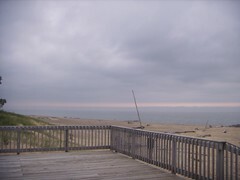 whats a good amount of time to set aside to do the whole thing and be able to stop at some beach's/sites and of course food spots? What I do know is that I have the trip ready to leave around July 22nd and the plan is to start going north on 94 with a stop in Milwaukee for lunch...most likely Zaffiro's and Kopp's. After that, its up in the air...what you got for me? Last edited by Da Beef on August 3rd, 2008, 6:56 pm, edited 1 time in total. It might shorten your trip a bit, but a truly fascinating, anachronistic experience is to take the Lake Michigan Ferry from Manitowoc to Luddington, MI. Luddington has a surprisingly good brewpub for such a small town. Also, it might be a bit close to Milwaukee, depending on whether or not you take a leisurely drive, but there's a classic seafood restaurant right near the harbor in Port Washington. Smith Bros is closed down. 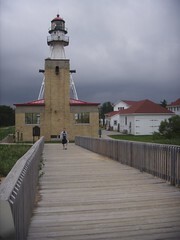 I like New Port Shores in Port Washington, it is the locals favorite. I am in Racine, the thing here are the Kringles. People seem to like O&H or Bendtsens, I am a Bendtsen person myself. There is some pizza place in Sheboygan that people seem to love that I have not been to as of yet, search the board if you are interested. I am originally from the other side of the lake in Michigan. If you are a homemade onion ring person, check out Clementines in South Haven or St. Joseph. How much time are you taking and where are your stops?? I would second aschie's recommendation for the Leelanau Peninsula and for Lawrence Mawby's sparkling wines (I have a bottle of the Conservancy chilling in my fridge at this very moment). 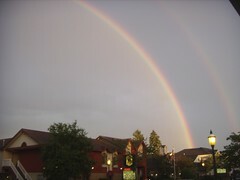 My fiance has spent a lot of time in the last 3 summers in the Interlochen/Traverse City region and we love it there. Sleeping Bear Dunes is a great National Park to visit up in the area as well. The popular place to eat up there for breakfast is the Omelette Shoppe. We also like to catch a minor league baseball game--the Traverse City Beach Bums have a beautiful stadium. Also, there is the Cherry Hut in nearby Beulah, MI. The food is not so great, but the pie is pretty damn good. One more thing is the Cherry Bowl Drive-In Theatre in Honor, MI. They have a snack shop where they pop popcorn out of an old-fashioned popper from the '50s. We always have a blast there. Hope this helps. Enjoy your trip! I'm only really familiar with the Traverse City/Sleeping Bear Dunes area of your trip. I second Sharona's recommendations, and also have a few more. Here is a good website with restaurants, farm stands, etc. Traverse City/Sleeping Bear Dunes-centric. 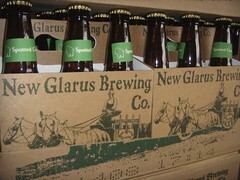 A Glen Arbor institution. Good food and drink in a genuine up north atmosphere. Breakfast, lunch and dinner. Gets very crowded, esp on weekends. Great salads, eclectic menu. Casual atmosphere. Ice cream next door at the Pine Cone. 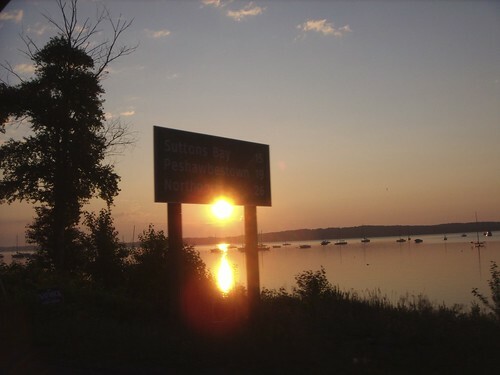 Sutton's Bay is really cute. They have an excellent grocery store just out of town if you need to load up. 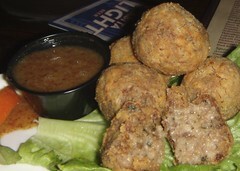 Excellent food with a Southern influence. Great service. Good for lunch, too. 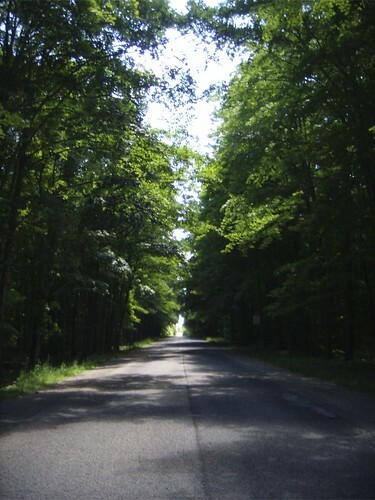 This one is on the "tunnel of trees" part of the tour, south of Mackinac Island in Cross Village. I have not been to this restaurant in about 20 years so take this for what it's worth....either way you'll want to go on the tunnel of trees though. This is in one of the buildings in the old mental hospital area. They are lovely old buildings on nice grounds that have been redeveloped instead of torn down. A nice stop on your tour. I have been inside this restaurant but was not able to go back. I really liked the atmosphere. There are also bakeries and coffeeshops in the old hospital grounds. Also, make sure to go to Mackinac Island for at least a day. You will have to leave the car and take a ferry over. TripAdvisor should have good info on Mackinac Island--if not let us know. One tip: As you know, July is high season in Michigan so it might be worth getting a book or doing some quick research--enough to get the "spine" of the trip in place and book places to stay. Even though it's only April I'd be pretty quick about booking places to stay, especially if you want to be on the water. Also, sunsets on the Lake Michigan side of the circle are great as long as you have clear view to the west and aren't in a bay, so if you want to splurge on a waterfront place you'll get a good return on your money there. Also good for dinner picnics or grilling out. I always like to put in a positive word for the Tabor Hill dining room. An aesthetically beautiful vineyard (though I find their vintages wildly incosistent), and a nice touch at the table. Kona kampachi, elk, other game flown in fresh, and much local Michigan produce as the mainstay. Squash blossom and heirloom tomato app is usually fantastic in the summer. 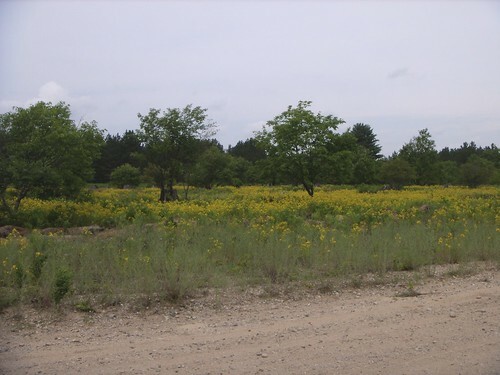 grits wrote: One tip: As you know, July is high season in Michigan so it might be worth getting a book or doing some quick research--enough to get the "spine" of the trip in place and book places to stay. Even though it's only April I'd be pretty quick about booking places to stay, especially if you want to be on the water. Also, sunsets on the Lake Michigan side of the circle are great as long as you have clear view to the west and aren't in a bay, so if you want to splurge on a waterfront place you'll get a good return on your money there. Also good for dinner picnics or grilling out. Good advice. I'd also add that due to its Northern position and western placement on the "Eastern" time zone, the sun sets pretty late in July in Michigan. So plan your dinners accordingly -- I remember some guests of mine who "hung out" at the beach and bars drinking not realizing that it was 9:30 and they hadn't eaten since 12:00 noon; it's really deceptive when it's 9:45 and still light out. Empire, Michigan (in Sleeping Bear Dunes area) has a really nice public access beach with great views. You can eat in the Friendly Tavern if you want a burgers/fries type of meal. Tiffany's ice cream is down the street, and there is a grocery store next to the Friendly. Empire is a cute small town. Grocer's Daughter chocolates is just out of town up the hill and very much worth a visit. I think Empire or Glen Arbor is the best base of operations for the Sleeping Bear Dunes. 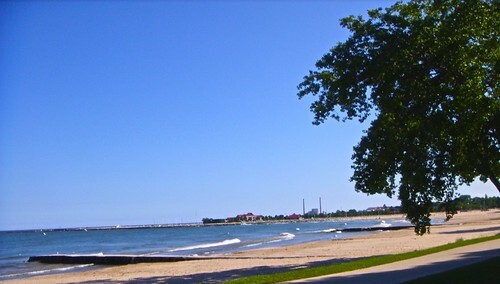 If you stay in Empire and you are not on the water you can walk over to the public access beach. Glen Arbor's public access to Lake Michigan is not as good as Empire's. We camped out equidistant from Glen Arbor and Empire two summers ago. Nice place for a base of operations, and easy to get to everything. I don't recall the name, but a google search of sleeping bear dunes camping should turn it up -- it isn't part of the park, though (just watch out -- my GPS sent us down a dirt road, rather than that 1/10 mile longer route that didn't). 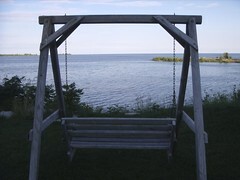 Nice relaxing part of the world -- too far from everything big to ever get crowded, as compared to, say, Door County. 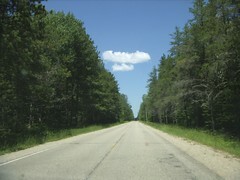 grits wrote: This one is on the "tunnel of trees" part of the tour, south of Mackinac Island in Cross Village. I have not been to this restaurant in about 20 years so take this for what it's worth....either way you'll want to go on the tunnel of trees though. I've been to the Legs Inn within the last couple years and can attest to the fact that it's still great. My family has a house in that neck of the woods, and I have to say that a lot of the restaurants leave a bit to be desired in part because there isn't a lot of variety between menus...planked whitefish, burgers, ribs, shrimp baskets, etc. American Spoon Gelato Cafe in Petoskey and Traverse City. American Spoon is a well-known name in the Traverse Bay area. 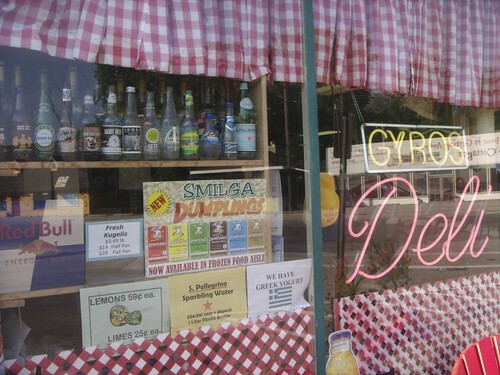 It's a small chain of shops that sell jams, jellys, sauces, preserves, etc., made with local fruits and produce. Their cafe features dishes made with their products and some fantastic gelato. See spoon.com for more info. Mackinaw Brewing Co. in Traverse City. (see www.mackinawbrewing.com) I've only been here once, but had a decent sandwich and a tasty cold beer. I'll return to investigate more! 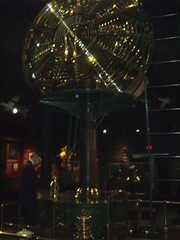 Did the circle tour several years ago. 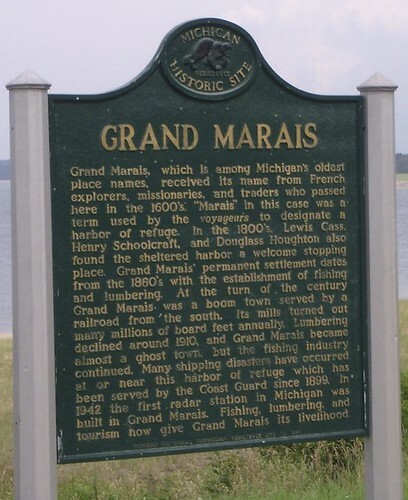 We took about 5 days, and enjoyed the Michigan part of the tour more than the Wisconsin shore of Lake Michigan. While in the UP, I'd recommend a detour up to the south shore of Lake Superior to see Pictured Rock National Lakeshore. As far as food, the one place that I can recall was Pinheads bowling alley (how can you not stop at a bowling alley called Pinheads?) The pizza that they served was very good. IIRC it was wood fired pizza. I would recommend that Dog 'n Suds one block away. It is open now. 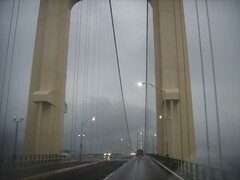 It is across the bridge in Montague. It is the finest example I have seen. Pristine clean. Just wear your bathing suit and wading shoes! There is a cajun restaurant up there that's supposed to be good but for some ridiculous reason it is closed on the weekends so we've never been there. I've heard the Brownstone Inn in AuTrain is supposed to be very good, but I haven't gone there. Head North on I-43. Take Webster Avenue Exit #187. Take left onto Webster Avenue and head Southwest towards downtown. Turn Right onto Main St. Head Northwest on Main Street over Fox River. Titletown is immediately to your right located across the street from the Neville County Museum and the famous Packers Receiver statue. From the East: Method #1: Interstate 43 to Highway 172 West. Highway 172 to US 41 North. 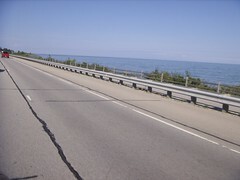 US 41 North to Lombardi Avenue exit. 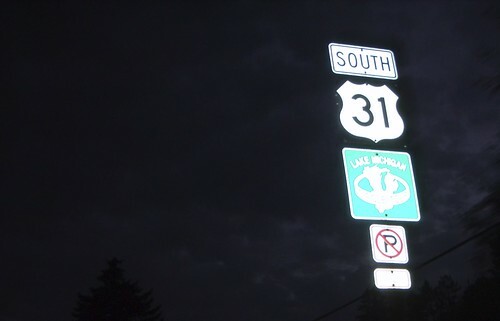 East (right) on Lombardi to Ridge Road. South (right) on Ridge Road to Kroll's West Restaurant on the Right. Method #2: Interstate 43 North to US 41 South. US 41 South to Lombardi Avenue exit. East (left) on Lombardi to Ridge Road. South (right) on Ridge Road to Kroll's West Restaurant on the Right. Great burgers with fun booths that have a push button waitress call- tons of packers memorabilia. 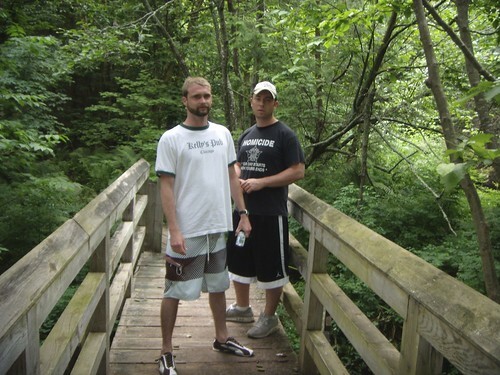 We decided that we would go up into Wisconsin to start the journey around the lake. 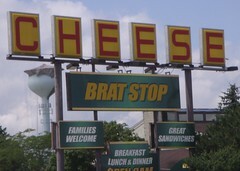 Our first scheduled stop that morning was at the Brat stop just across the IL/WI border in Kenosha, where we loaded up the cooler with New Glarus' spotted cow. One of my inpatient friends insisted we wait while he had a brat even though he knew we were just a couple hours away from the brat mecca of Wisconsin. The brat stop's brat was the most normal tasting thing on the trip not bad just nothing like what was coming. 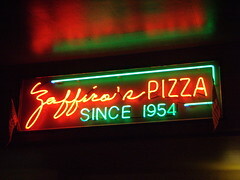 We took 41 up into Milwaukee and while we didn't make it to my favorite pizza place in the world, I thought it necessary to document/inform anyone taking the tour that there is a great super thin crust pie to be had at Zaffiro's, which is on the circle tour coming the other way. A simple search of the site can give you all the info you need on this place. Thanks to LTH for this find. I had just been in Milwaukee for summerfest and so many other times that we just went thru the city. If you havent been I recommend spending a half day or day in the city, it really is a fun place to spend the weekend and its suitable for people of all ages. 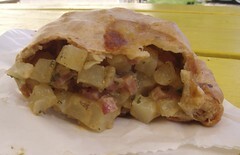 Oh by the way, its a great eating city. On we rode to Sheboygan, WI. It is in this pretty little city that sits on the lake where one of my favorite roadfood stops in the land rests. Charcoal Inn butterfly's there brat's and cooks them on the charcoal grill, when done they are placed on a brat roll from the local bakery down the street and loaded up with mustard, onions, pickles and a insane amount of butter. 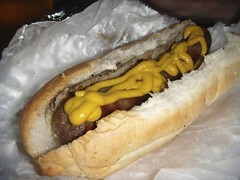 The first time I ever went here I ordered my brat with just mustard and onions. 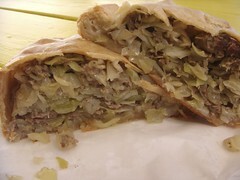 When they brought it out I looked at the amazing sandwich and thought they put a huge glop of mayonnaise on it. After a quick lick I realized it was just about a half cup of butter...mmmmmmm. Its my belief that I dont need to try any other places brats, these things just melt in your mouth and it doesnt get any better than Charcoal inn, maybe in brat heaven but not anywhere else. The few times I have been the place is filled with locals of all ages and usually filled with smoke. The waiter immediately knew we were out of owners when my friend stood outside to smoke his cigarette. 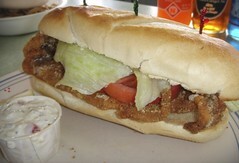 The menu also boasts that they were named to have the best steak sandwich, a Wisconsin tavern specialty, in the state. They also serve burgers, double brats and brat-burgers (brat and burger patty on brat bun) I decided to give the steak sandwich a try this time. 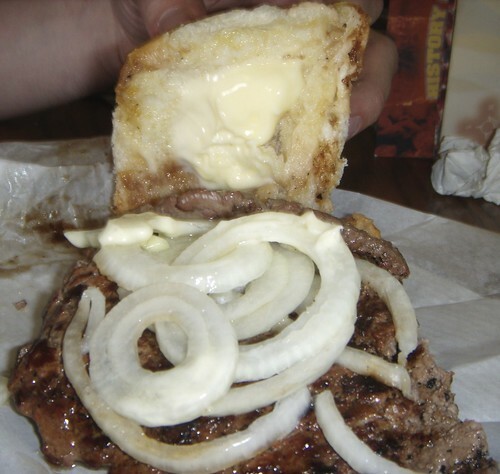 Up-close view of the tavern steak sandwich ordered with pickles and onions "light" on the butter. Yes thats light, and what you dont see is the same amount on the bottom bun below the steak burger patty. This is what I would think a steak burger should taste like although I was expecting some sort of skirt steak or something it was good but I recommend sticking with a brat or three when you order. With our stomaches filled we rode on. Until I spotted a cool looking drive-in in Manitowoc. 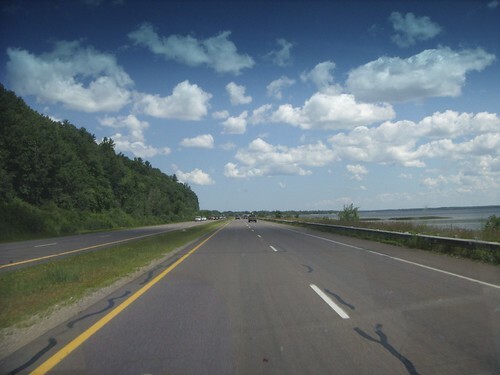 On we went into Green Bay and decided to take the scenic drive into the inlet up into Sturgeon Bay while listening to some Chicago Cubs baseball. Next stop was in Green Bay, where we quickly grabbed a burger from a place called Kroll's. Sorry no pics but it was a good burger and worth the stop if your in the area. The most interesting part was watching the yocals eye me as I purposely donned a Devin Hester jersey during my visit...DAAA BEARS! It was about 11p when we crossed the WI/MI border and got into Menominee, MI. Before calling it a night we stopped at a place for dinner. Honestly the food was so bad I cant remember the place's name but they did boast some damn good pie. 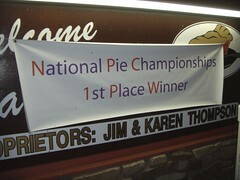 Im no pie expert but we told that they won for their lemon meringue, so we tried. Upon waking up it was time to eat. 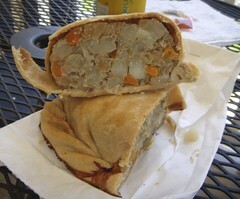 I felt it necessary that my first meal in Michigan be a pastie (pronounced pass-t). 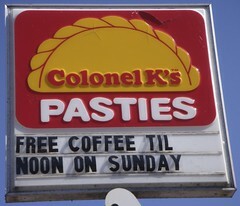 Just like in every town in MI, Menominee had a local pastie joint. 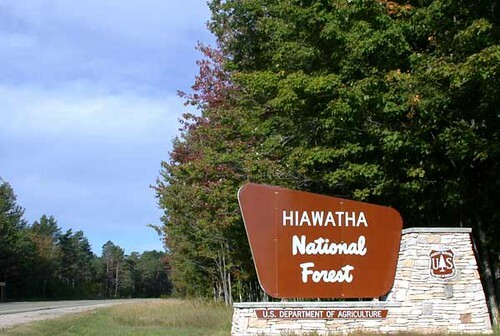 After loading up on the calories in the am, it was time to drive up to the Hiawatha national forest. 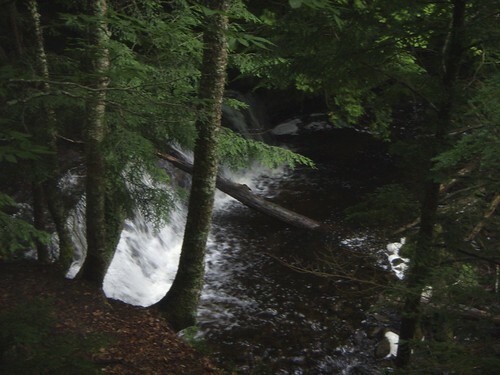 We decided we drive from Nahma which is located on the top of Lake Michigan up to Munising, which rests at the bottom Lake Superior. The drive is a very scenic one that takes you thru the forest on local highways. Upon arriving in Munising which lays on Lake Superior we decided it was time for some food. 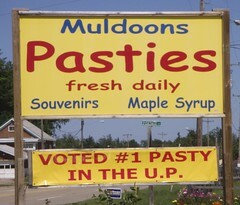 Muldoon's pasty shop had signs directing us to the "best pasty in the U.P". 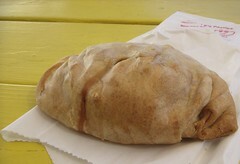 It was a good pasty and at the time ranked as #1 on my list. Back on the road but this time we weren't on the Lake Michigan circle tour. When it comes to food on the circle tour, fresh/smoked fish runs abundant. You wont make it thru a town without seeing a fishmonger or four. 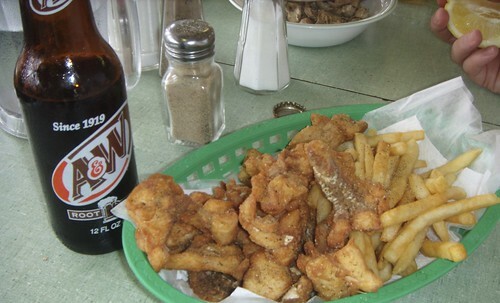 Usually they offer up fresh fish and smoked fish along with homemade beef jerkey. 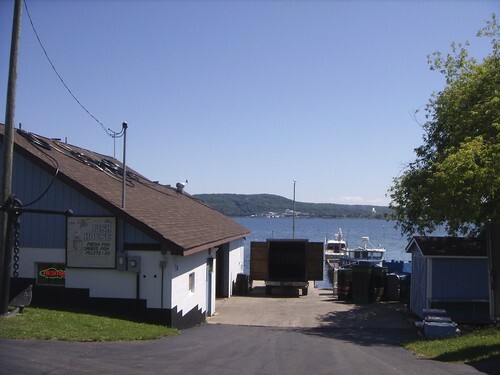 Captain Ron's smoked fish in Munising, MI sits right on the lake (top pic). 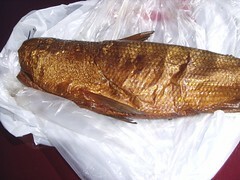 There are no listings that I can find on the internet but if your up there im sure youll find it (drive towards lake) The smoked whitefish was outstanding and highly addictive, unfortunately it wasnt something you pack in the car to eat later. After talking to some people about what to do up in the U.P, we were told that the best town for some drinking and fun was Marquette and there wasnt any other towns that would have any action close to Marquette, home of Northern Michigan U. So we headed up there to stay the night. Marquette was my favorite stop on the trip. It was a a real scenic little city that had good eating and a fairly wild nightlife during the summer. It seemed everyone I talked to that lived in the area loved it and wasnt planning on leaving anytime soon...I could see why. We stayed at the Ramada Inn which was a few blocks from the water located on Washington St, the towns main drag. Marquette had a really nice dining scene and the beaches were packed by day and the bars were packed into the night. I really like the ladies up there, great time in a great town. 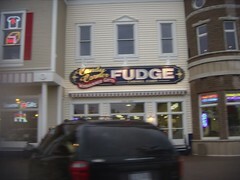 The first place we got to check out for food was one of my favorite stop's on the trip. 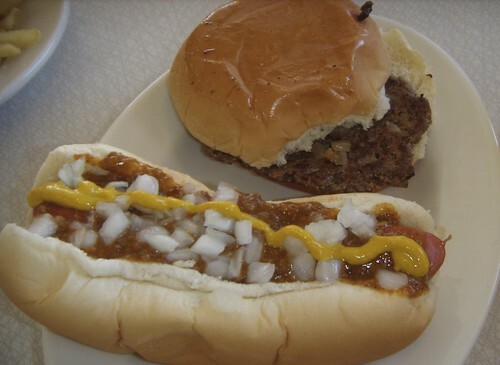 The coney joint was within a stones throw from the Ramada entrance and they served coney dog's and sliders along with shakes and some really good thin cut fries. I ended up eating here a total of four times during our time spent...really good roadfood type place, which is what im all about. 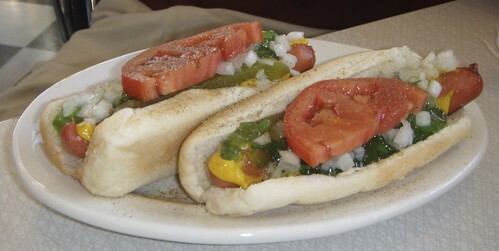 a coney dog with a slider. Me being the junkie that I am for food, I decided to take a walk around town after the Coney joint and see where we could catch dinner at and maybe find a spot that was showing the Cubs-D-Backs game later. 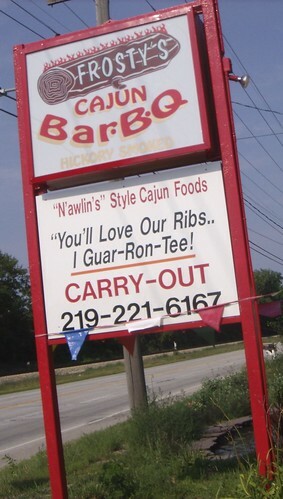 irisarbor wrote: There is a cajun restaurant up there that's supposed to be good but for some ridiculous reason it is closed on the weekends so we've never been there. When I read that they were closed weekends I knew this was that place and I was very excited to try it. 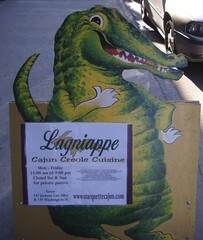 I love cajun and in Chicago there really isnt anything good so I always jump on the chance when I see a spot on the road. We ate at the bar where the bartender was very friendly in giving us advice and tips on what to do around the area and where to go at night, this was my favorite restaurant of the trip. Everything was really good including the live music and atmosphere each time we were there. The bartender who's name escapes me poured some damn good Hurricane's. Unlike the Pat O'Brians version these were a different recipe that were made by pouring dark rum into the bottom of the glass, fresh squeezed mix of juices in the middle and light rum on top. 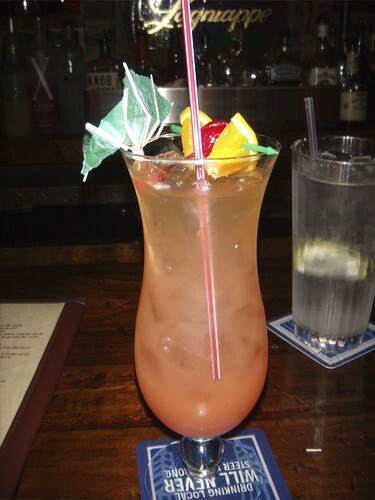 The reason I cant remember the name of the dude bartending was b/c I had three category five hurricanes before we ate. Hurricanes were served category 3, 4 or 5. Higher the number the more liquor. The beginning of a night with my buddies, Bell's, Jameson, Patron, Jager and the toilet. 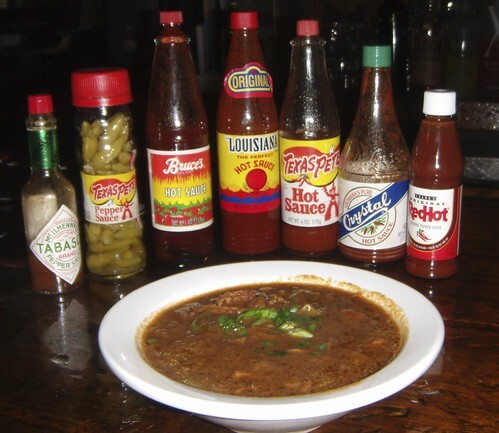 bowl of gumbo with the basket at the bar's selection of hot sauces. 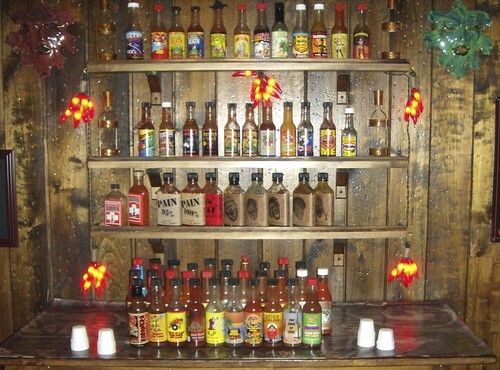 hot sauce bar for your food. We also got introduced to the owner who was a nice super nice lady who wanted to know all about our trip and how we liked the UP and her place, turns out she has a daughter who graduated from cordon bleu in Chicago and is now working at a restaurant down in New Orleans and will one day move back home with some new recipe's and knowledge of the cuisine and take over the family spot. Lagniappe was a very satisfying spot all the food was really good each time and at 9p upon closing our first night there, a local Cub's fan directed us to "The dog house" directly across the street where they carry the MLB season ticket and show all the Cubs games. After that we stumbled over to the up-front which was the spot on Wednesday's. Very fun although I dont remember much. The first night was so satisfying and brain damaging that we decided to stay another night in Marquette. We got great weather the whole trip and spent the day at the local beach checking out the scene. 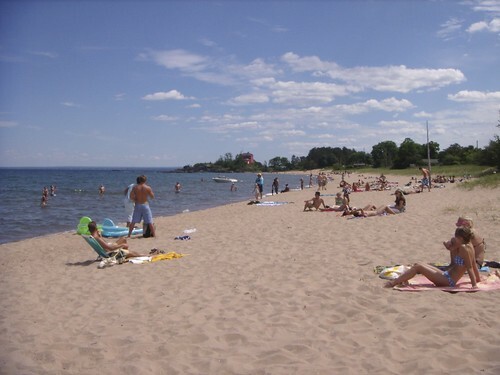 The beaches of Marquette on Lake Superior are beautiful as are the young females that flood it. Now I know why they call it Lake Superior. I was really impressed with the great great lake. The water was cold and I saw lots of ships transporting whatever they do and it just seemed so much more great then lake Michigan. Dinner that night was at Vierling's downtown about a block from the lake. The day before at the Cajun joint my friend had said to me "goddamn you werent kidding, are you going to take a picture of every thing you eat?" "if we go somewhere and you dont take a picture im paying". Sorry folks, no pic's. 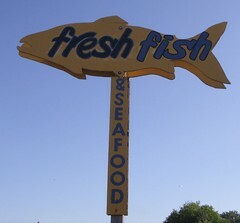 As expected the super fresh whitefish was awesome. They get it fresh from Thill's daily. The local monger is located just down the block on the lake. We each had it a different way, grilled, blackened and baked, all were exceptional. 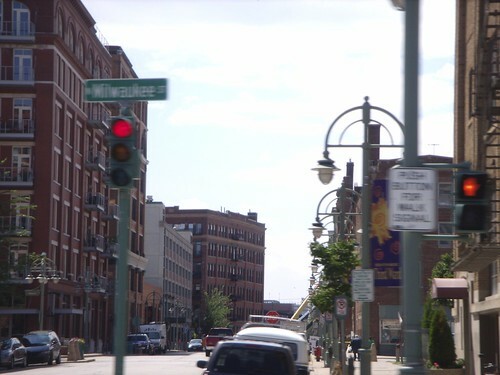 For those of you reading this post and wondering about the nightlife in Marquette, its pretty fun in the summer and there is usually a spot all the younger people go each night, just ask around. After spending wed. and thur. night in Marquette it was time to continue our Journey although we didnt want to leave. We drove back into Munising and decided to take the closest roads to the lake along the lakeshore to see some of the fall's and beaches along the pictured rocks national lakeshore. as you can tell by the unpaved dirt roads, we were way up there. People must ride around on snowmobiles instead of cars in the dead of winter, the roads are bumpy and rough. Mosquito Fall's...we didnt make it to the beach, it was 2 miles further the opposite way of the car. On the road again. 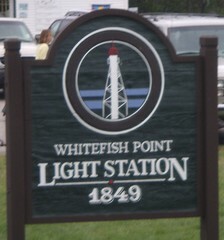 Now we headed towards Whitefish Point to take a look at the Great lake's shipwreck museum. Christmas, MI. 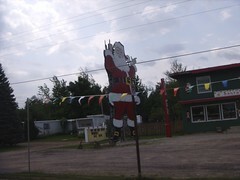 Home of the worlds largest x-mas store...and a bunch of other x-mas themed places...for the kids amusement, the kids! We stopped for food/gas in Grand Marais, MI. This ended up being a blessing. One of the things I try to do on a roadtrip is not plan to eat at too many places. this way you always stumble across a gem tucked away somewhere or something unexpected...the Stern's would really love this place. 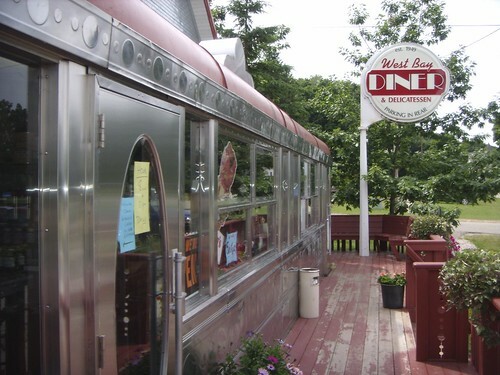 West Bay Diner- "This rare 26-seat 1949 Paramount "Road King" diner car is the former Matamoras diner from the Pocono Mountains of eastern Pennsylvania. 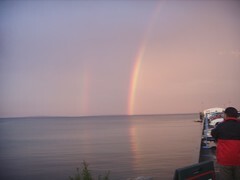 The diner came across the Mackinac Bridge to the shore of Lake Superior in 1997"--from a postcard the waitress gave me. 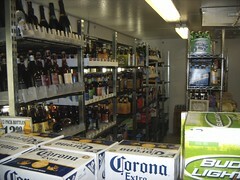 This is a real small spot and if busy your order may take a while but its all worth it. On top of the diner fare they also have a ice cream station, deli, pop shop and a bunch of other things to keep you busy during your wait. Also featured on the menu is the days selection of burgers. On any day you may have a choice between beef, elk, buffalo and venison. 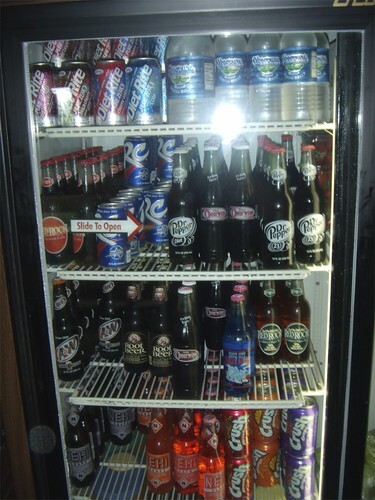 One of the two pop coolers where they feature a nice selection of bottled pop. 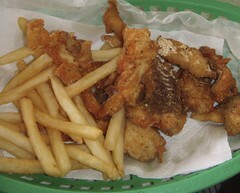 Sounds great, fish and chips, chunks of whitefish, fried whitefish sandwich. 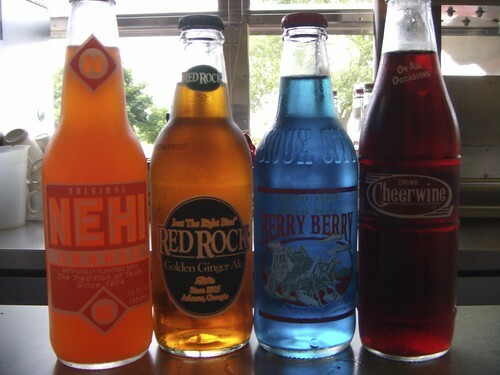 Some pop for the cooler. Back in the car to head to the museum. 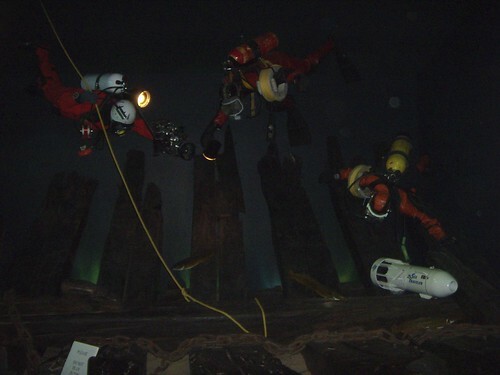 The shipwreck museum was an interesting place to learn about all the shipwrecks that have happened through the years. Time to head down to to Mackinaw City and cross the bridge. Of all spots visited on the trip, here was my least favorite. Mackinaw city reminded me of Cape Cod or some east coast ocean town with all the touristy attractions, games/arcades, etc...we decided it didnt really fit the bill so after convincing my friends to stop so I could get a pastie (they had enough for the year they said) we would head down to Petoskey, MI and visit there casino's. 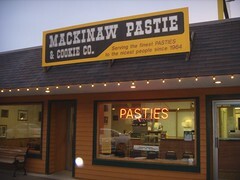 Mackinaw pastie co. won the gold medal on the trip. 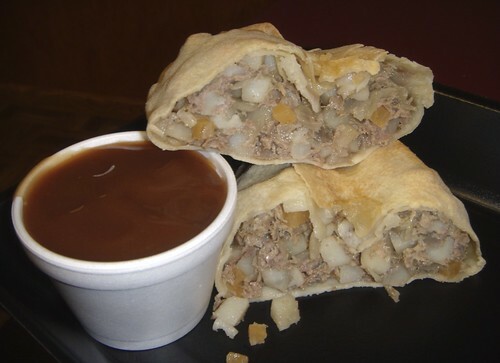 These were really good and the gravy only enhanced the favor, I would eat these for lunch every day in the winter. Back onto the lake Michigan circle tour and a night cruise for some gaming at the local casinos (Odawa, Victories) in Petoskey, MI. We got into Petoskey around 8p and immediately hit the casino floor. Mistake or not we forgot to get a room and didnt realize it until 2a, so we decided to stay at the casino and leave when the sun rose. We left the casino at sun up and rode into Traverse city. I thought that it was a little nicer than mackinaw but still very touristy, we had a great breakfast at Ham-Bonz, where they had a bunch of dishes with ham cut off the bone. 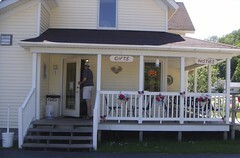 No pics again but I would recommend this place for a good breakfast in Traverse City. Prices were so high and room's werent available for another 5 hours since it was so early, so we left. We ended up cruising to the beach and after soaking up some sun, we decided that it was time to head to my buddy's summer home in Michigan City for some boating. Since it was the weekend it was so packed and booked everywhere we just decided that we would head down the lake and spend the next few days in Long Beach, IN. Harbor country is a place that i will document another time but on this particular trip I stopped in Union Pier to pick up some pop/beer from two of my favorite little country stores. Milda's corner market is a nice little grocery store/deli that has a great selection of bottled pop. 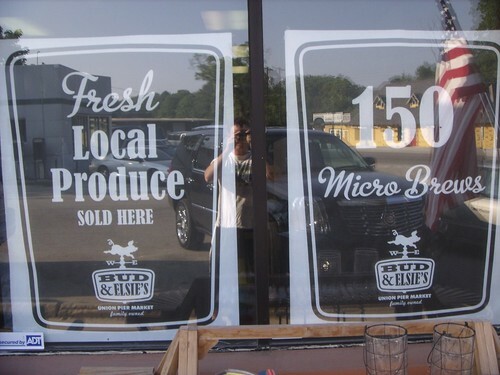 Right next door is Bud & Elsie's where they carry a great selection of micro brews. 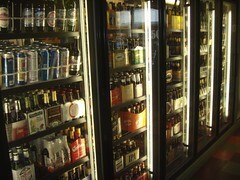 View from outside the beer fridge...view from inside. Frosty's Cajun BBQ has become one of my favorites. 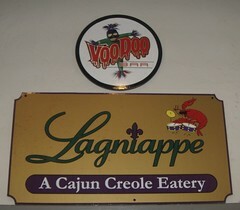 They smoke ribs and serve Cajun sides like succotash gumbo, red beans and rice and Cajun sausage. 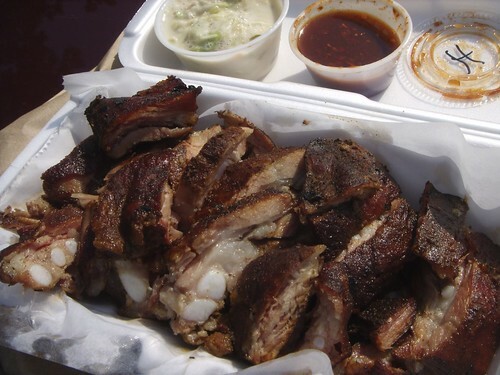 The star of the show are some of the best rib tip's you can consume. when this is place is on they are real on. Rib tip's with hot BBQ sauce on the side is the way to go...Im not really big on sauce with my smoked pork but I love their hot stuff. 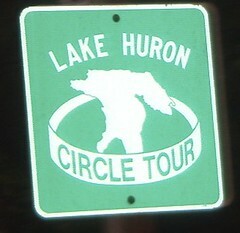 The best part about the Lake Michigan circle tour is it fits the description of fun for all. It doesnt matter if you go with the family, a group of friends, boyfriend/girlfriend, you can find a way to have a good time. I will update this page with others places I have found within the tours limits thru the years and I will also update with anything else I may have found recently. There are so many little towns and eateries along the tour it would take quite a few trips to try them all. Big thanks to everyone for their tips, I printed out each rec'd spot and tried to do as many as I could. More places to come as the days go by. 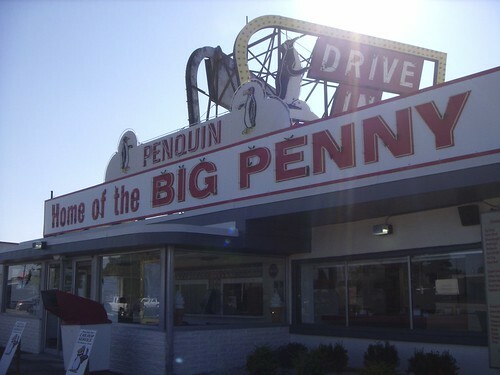 Cant find it listed tbut I can assure you it has reopened and its on 12-20 in Michigan city, IN around the blue chip casino. Last edited by Da Beef on August 4th, 2008, 8:32 am, edited 3 times in total. Great post, Da Beef! Your resourcefulness comes through loud and clear. 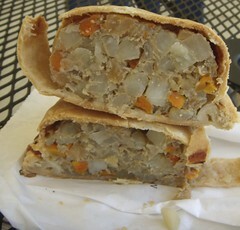 Loved the pics of the pasties--they really give a clear idea of the differences in fillings. I just got back form the Lake Michigan Tour, except that we went in the opposite direction, starting off on the Michigan Side and working our way around the lake counter clockwise. 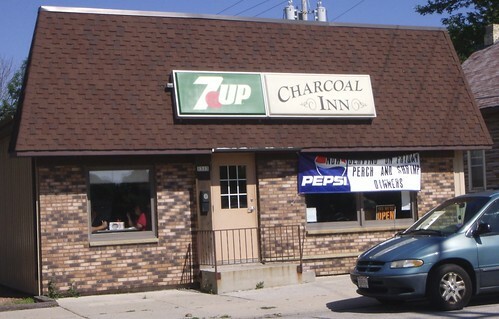 We even hit some of the same places including Charcoal Inn, which I found not very good (perhaps the worst meal of the entire trip) and Kroll's. I'll probably be posting some pics ion the near future. 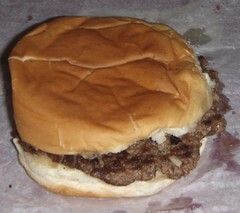 I've got a few from Kroll's showing their burger, which was highlighted by a well above average bun and the distinct taste of charcoal grilling. Looks like a great trip, I'm glad you experienced how wonderful Marquette is. We might have even overlapped, since Beth and I were up there from last Saturday until Thursday. On your next trip up there: stop at the Brownstone Inn, on M-28 in Au Train, about 10 miles or so west of Munising (it's on the way from Marquette to Munising). Get the whitefish salad, or any of the other whitefish dishes, and thank me. Even better than the whitefish at the Vierling. While in Marquette on this trip, we also made it to the Waterfront restaurant, a new upscale place at Washington and Lake Shore Drive. The elk chops? Fantastic. 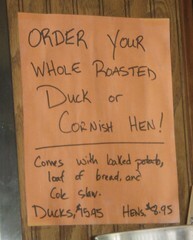 The duck breast? Inedible. Disgusting. 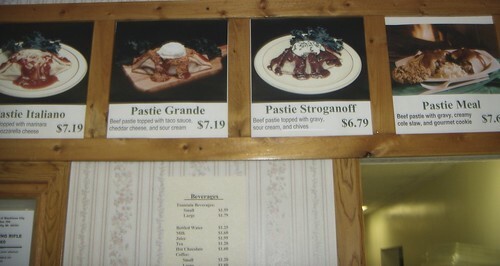 Otherwise, the place is fairly charming, and I suspect the more traditional stuff on the menu (steaks, chops) are good. But it's no match for the whitefish at the Vierling, especially not at twice the price. Thanks for a very spirited trip report. I hope your friend made good to pay your meals when you didn't photograph them. I'm glad they tolerated all your pastie tasting adventures. I never knew there were so many variants available. Again, thank you for your time to put this armchair vacation together. And besides the whitefish, the Vierling does a mean Cajun Ribeye! Datapoint. The Waterfront closed December 6th. 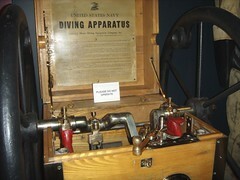 Owner Mark Norris blamed the current economy. "Absolutely, the economy," he said. "After Labor Day we took a big hit. It's like you pulled a plug and people weren't going out to dine. It's not just us, it's probably nationwide." 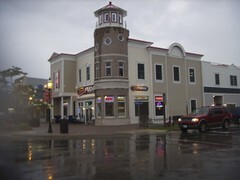 The Italian fast food restaurant Fazoli's on US-41 and The Coney Joint on Washington Street closed in November. Norris said the restaurant will be put up for sale. He had no plans to try to start another restaurant. "Restaurants are risky to begin with," he said. "Plus right now the economy is just not supportive. People don't have the disposable income to go out to eat as much." 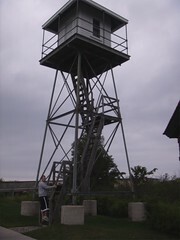 Not sure if this is the best place to post as I didn't do the Lake Michigan Circle Tour. However, my family and I did just come back from a few days up in Mackinaw City. For the most part the food was average in quality and over-priced. 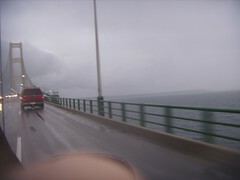 However, we did venture over the bridge to St. Ignace where we stopped at Manly's Smoked Fish which is mentioned up-thread. 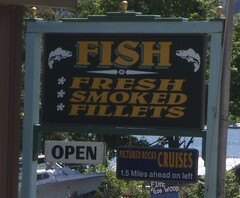 The owner smokes his own fish and makes his jerky. I tried the trout and beef jerky which were delicious. - Great ice cream, enjoyed right on the farm! Lines are long but move quickly. Their cherry ice cream is fantastic. - Loved the diner feel and all things cherry. Don't leave without a slice of cherry pie a la mode! - Hands down, my favorite cherry pie spot we visited and the best chicken pot pie I've ever had... so much so that we ordered some when we got home to get our fix. 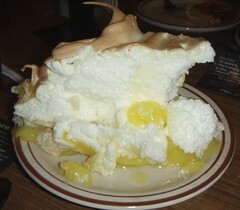 Thankfully, I learned our local Sunset Foods carries their standard & mini sized pies and can order pies for us as well! 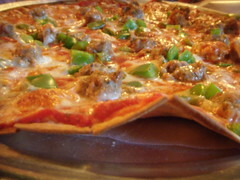 - We ate at Tap Root Cider House after the tour and the pizzas were delicious! - Lunch here was relaxing as it's away from the main/central boarding dock and not as busy. Great views and it's easy to slip into a leisurely walk to an open field along the coast after lunch. We enjoyed their Deviled Eggs, Michigan Chicken Salad Sandwich and Classic Crab Salad Roll.